Corporate Flight Attendant Terrific Tiramisu Dessert Corporate Flight Attendant Community: For Private Jet Flight Attendants! Sometimes a dessert is just too divine to pass up on getting the recipe. This recipe for Terrific Tiramisu Dessert is one of them. A young woman named Shura showed up at an office party with this dreamy confection. It’s too indulgent to simply describe with words, but I’ll say that this scrumptious version of the popular Italian dessert tiramisu is simply divine. With a mixture of espresso coffee, whip cream and Ladyfingers, the flavors will melt in your mouth and leave you wanting more. If you’re looking to make a very classy, delicious dessert cake for a special dinner party or holiday gathering, you can’t go wrong with this Terrific Tiramisu dessert. Shura’s tips even provide you with optional ingredients and special instructions. Begin making the Tiramisu at least 3 hours before serving time, or early in the day. 1) In a large bowl, with wire whisk or fork, beat mascarpone (or cream cheese mixture), salt, ½ cup sugar, 3 tablespoons espresso, 1 teaspoon vanilla extract, and 2/3 of grated chocolate (set aside remaining chocolate for top of dessert). 2) In small bowl, with mixer at medium speed, beat 1 cup heavy or whipping cream until stiff peaks form. With rubber spatula or wire whisk, fold whipped cream into cheese mixture. 3) In small bowl, stir instant espresso-powder, remaining 1/3 cup espresso, remaining ½ teaspoon vanilla extract (if you use liqueur, then add 1 tablespoons water). 4) If ladyfingers are sliced, separate them in half. Line 2 ½ quart glass or crystal bowl with one-fourth of ladyfingers; drizzle 2 tablespoons of espresso mixture over them. Spoon one-third of the cheese mixture over ladyfingers. 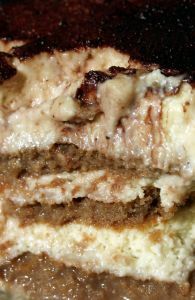 Repeat with ladyfingers, espresso mixture, and cheese mixture to make two more layers. Drizzle remaining espresso mixture on ladyfingers. Sprinkle remaining grated chocolate over top of dessert. Reserving one tablespoon for garnish. 5) In a small bowl, with mixer at medium speed, beat remaining ½ cup cream and remaining 2 tablespoons confectioner’s sugar until stiff peaks form. 7) Sprinkle reserved grated chocolate on whipped-cream rosettes. Refrigerate until chilled and flavors are blended (at least 2 hours).